The partnership between the City of Fremantle and DADAA that has revitalised the Fremantle Old Boys’ School was recognised at the State Arts and Culture Partnership Honours at the State Theatre Centre earlier this week. Nominated by DADAA, the City of Fremantle was recognised in the Metropolitan Local Government category. The partnership has established an arts hub in the heart of Fremantle that supports people with a lived experience of disability from across the metropolitan area to choose Fremantle as their destination for arts and cultural participation. “This iconic building now connects the WA disability community with professional artists, broadening how we as a community view ourselves at this significant time as the NDIS rolls out across Australia,” said David Doyle, Executive Director of DADAA. The State Arts and Culture Partnership Honours acknowledge the outstanding contributions of individual philanthropists, businesses and organisations who partner with arts and cultural groups across WA. 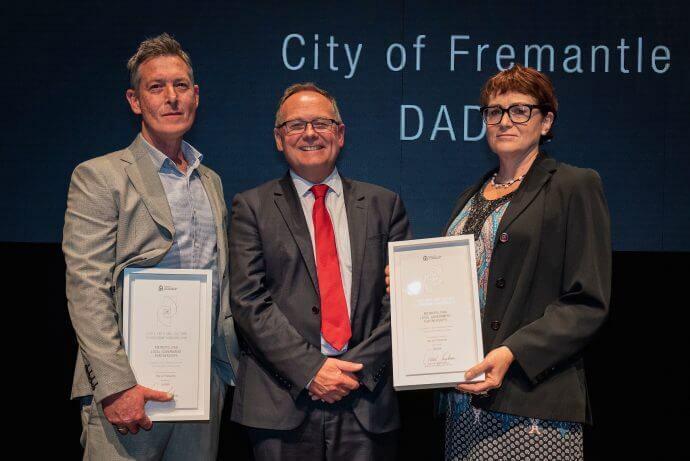 Image: DADAA Executive Director, David Doyle (left) pictured with David Templeman MLA and Deputy Mayor of the City of Fremantle Ingrid Waltham at the awards presentation.